I love making things that allow me to get physical. In this case, wielding a meat mallet! A paillard (pronounced: pey-yahr) is a French technique, and is essentially a piece of meat (traditionally chicken or veal) that has been pounded flat. It is a clever technique; pounding the meat both tenderizes and shortens its cooking time. 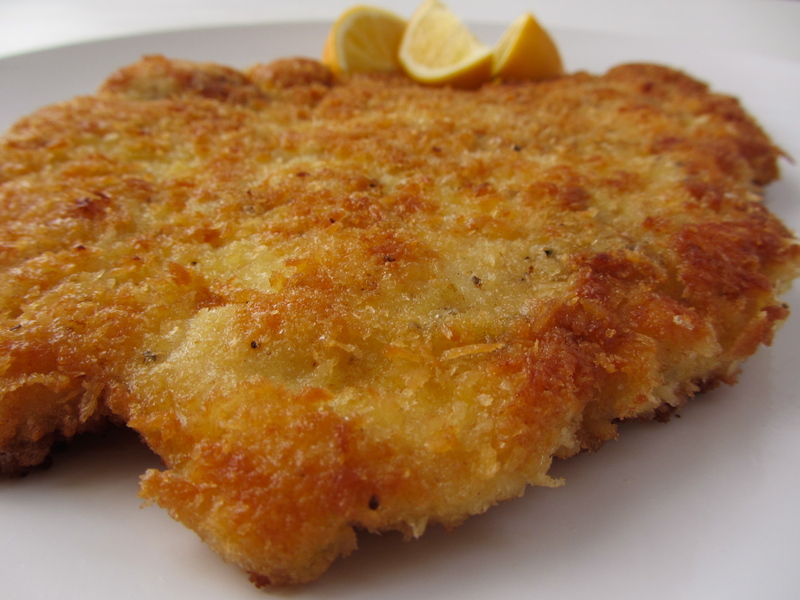 By breading the chicken, it creates a crispy coating that also keeps the meat from drying out during cooking. (Side note: panko is a Japanese style breadcrumb.) The end result: an opportunity to work off some excess stress, followed by a quick and delicious meal. 1. Place each chicken breast between two sheets of plastic wrap. Pound with a meat mallet to 1/4 inch thickness. Season both sides with salt and pepper. 2. Beat the egg and place into a shallow dish wide enough to hold the flattened chicken. Place the panko into another dish of the same size. 3. Dip the chicken into the egg, then into the panko. Gently press down to evenly coat. 4. In a large skillet over medium-high heat, add enough olive oil to coat the bottom of the pan. Once the oil is hot (check by dropping in a panko crumb, it should gently sizzle), fry the chicken until golden brown, about 2-3 minutes each side. * When pounding, start in the center and work evenly around the chicken. Don’t pound too hard – you don’t want to tear the meat to smithereens. * I prefer panko because it fries up very light and crispy, but regular breadcrumbs will work too. * If you are making multiple paillards, wipe out any burnt panko crumbs between batches, and add more oil to the pan as needed.